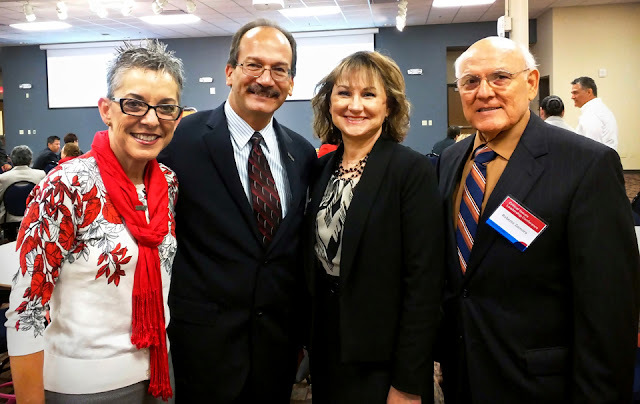 EDINBURG, TEXAS – SEPT. 11, 2015 – The University of Texas Rio Grande Valley knows a thing or two about change, and its leaders want to help area school districts navigate the changes they may experience. Throughout the conference, more than 60 administrators from school districts throughout the Valley heard from UTRGV faculty, who discussed best practices for leading during times of transition and change. They also participated in group activities and discussions. In his welcoming remarks, UTRGV Provost and Executive Vice President for Academic Affairs Dr. Havidán Rodríguez gave educators a history of UTRGV and its plans to become an emerging research institution that will increase educational opportunities and commit to student success. For the new university to be successful, it needs to form strong partnerships with local school districts, he said. Educators who attended the conference said they were excited about the changes in higher education in the Valley and look forward to continuing their partnerships with UTRGV. Michael Sanchez, head of the mathematics department at Weslaco East High School and a UTPA alumnus, said he is excited to see more opportunities for students in South Texas. “The Valley is a very unique place when it comes to our students, and since UTRGV is here, we’re hoping that we can have a better focus and can better serve our students,” he said. Cynthia Ramos, the Lasara Independent School District’s coordinator for curriculum and instruction and federal programs, and a UTPA alumna, said she is heartened by the commitment UTRGV has made to all the school districts, big and small. “We don’t have to go far to be who we want to be, and our dreams can come true no matter where we want to go,” Ramos said. The Lasara district has fewer than 500 students, according to 2014 data from the Texas Education Agency, so she’s excited about UTRGV’s interest. “We have somewhere that will support us, and will actually guide us to where we need to be,” Ramos said.